Soft and pink lips are an important part to a healthy and alluring smile. Nurturing your lips is just as important as caring for the rest of your skin. Lips need regular hydration from the inside and out, as they don't have many natural defenses of their own and can be damaged from the dehydrating effects of; the elements, petroleum-based lip products and a lack of water in the body. Click here . (Divide your water intake up throughout the day - do not drink all at once). Tip #3 Don't be a "habitual lip licker". Many of us have been in the habit of licking or chewing on our lips, at one time or another = ouch! The result is often red, irritated, chapped lips. Saliva contains digestive enzymes that can break down the protective barrier of your lips, skin. Solution - keep your lips moist with a soothing lip balm... apply as often as needed to keep moist. Once again natural lip butter is best. You are going to be licking those lips and ingesting much of what is on them. (Some drug store brands actually have specific chemicals in the lip balm that can dry out your lips. Which means, you will be back to purchase more sooner than later). Tip #4 Optimize your beauty sleep by incorporating a humidifier into your bedroom. Turn on your humidifier before you retire for the evening (be sure to change or clean the filter regularly). This will help to replace moisture in the air, which will benefit your lips, skin, hair and immune system. Tip #5 Use a nourishing Lip Polish to remove dry skin - Apply 1-2 times per week. This treatment will help remove dead and dry skin, while moisturizing and nourishing your lips. 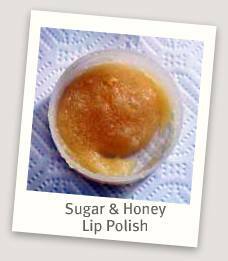 Sugar & Honey Lip Polish - Two ingredients are all you will need to prepare this very effective (yummy) lip treatment. Honey is a "flavourable" alternative to petro-based products (think Vaseline etc...) It acts a moisturizer, lubricant, soothing anti-inflammatory agent. While the sugar crystals create a gentle exfoliating effect. Helping to remove dry, chapped skin. Just think, if you happen to ingest some of this lip polish, no harm - no foul. Just mmmm mmmm good. Directions: Combine 1 tablespoon of honey with 1 tablespoon sugar (white or brown) ... in a small, sterile container. Mix together until it has a smooth consistency. Add a couple of drops of olive or vegetable oil for more glide, if needed. *Do not heat honey as this can cause the sugar granules to melt and render them less effective. Apply with a clean finger: To dry lips and gently massage in circular motion. Leave lip polish on lips for 1 minute and then wipe off with warm wash cloth. 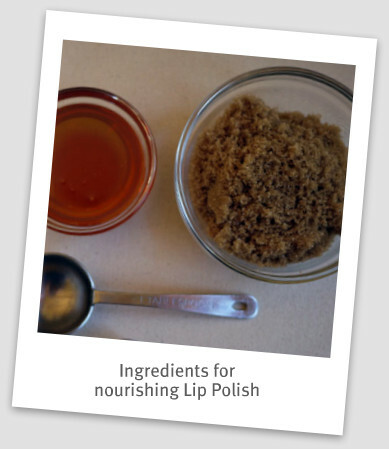 Finish off with a dab of honey, to your smooth lips. (honey also acts as a natural humectant, pulling moisture from the air to your lips). * Store in an airtight container for up to 2 weeks. Discard if it begins to separate or changes scent.